These seem like such a basic side dish to me, that I'm only now thinking that I should post it. I didn't learn to roast potatoes like this until about six years into my married life of cooking for my husband. This boil first, then roast method was taught to me by my awesome sister-in-law Heidi. These are currently one of my son's favorite things to eat. He kind of hoards them at dinner. 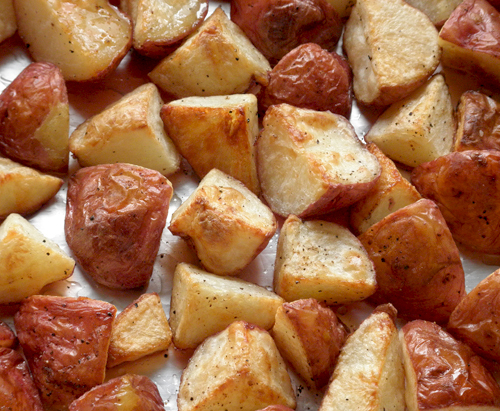 There are several ways I make these potatoes, but here is a recipe for the most basic. I have my lovely sister-in-law Heidi to thank for teaching me the trick of boiling the potatoes first, to rough up the outsides so they crisp up nicely. These red potatoes didn't do it as well as my usual yellow-fleshed potatoes, but they were still fabulous. I find that yellow potatoes are the best, red next, and last russets. All are good, but that's my order of preference. Since I can no longer find my Klondike Goldust potatoes, I have to make do with whatever other non-russets I can find. Preheat oven to 425 degrees Fahrenheit. 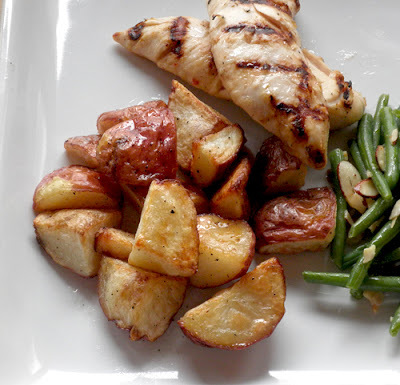 Line a cookie sheet with non-stick aluminum foil or parchment paper. Clean potatoes and cut into 1-inch chunks (very small potatoes are quartered, medium small, cut into eighths, etc.). Place in a heavy medium saucepan and cover with water. Add the tablespoon of salt. Bring potatoes to a rolling boil (uncovered) over medium-high heat. Only allow to boil for 1-2 minutes. Using the saucepan lid, carefully drain the boiling water into the sink. Place the pan back over a low heat, shaking and tossing potatoes until they look dry, about 1 minute. Remove from heat and add oil. Toss with a silicone spatula until potatoes are coated with oil. Pour potatoes onto prepared pan, scrape excess oil out of the saucepan onto the potatoes, and spread potatoes evenly over the pan. Sprinkle lightly with more salt and pepper to taste. Roast potatoes at 425 degrees Fahrenheit for about 20-30 minutes, or until as brown as you like, turning/stirring every 10 minutes. Makes 4-6 servings, depending on how hungry you are and how much you like potatoes.